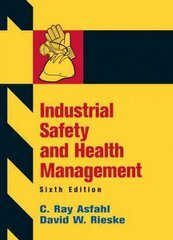 Industrial Safety and Health Management 6 Edition Industrial Safety And Health Management is ideal for senior/graduate-level courses in Industrial Safety, Industrial Engineering, Industrial Technology, and Operations Management. It is useful f or industrial engineers. Unique in approach, Industrial Safety and Health Management, 6th Edition combines — in one volume — an exploration of the time-tested concepts and techniques of safety and health management, a modern perspective on compliance with mandatory standards for workplace safety and health, and a variety of solved problems, case studies, and exercises. It provides reasons, explanations, and illustrations of the hazard mechanisms that form the underlying basis for the volumes of detailed standards for workplace safety and health. The new edition focuses on more of the real issues future safety and health practitioners will encounter, such as dealing with enforcement, protecting workers from ergonomic hazards, and accommodating the latest advances in process technology.